‘Saturday Night, Sunday Morning’ is the title of, San Antonio native, D.T Buffkin’s newest record and the follow up to 2013’s ‘Tattooed Rose’. Building upon the sonic foundations laid on the debut and, as the title would suggest, drawing from the classic-country inspiration of drinking and heartbreak, Buffkin’s record is 11 tracks of whisky soaked honky-tonk and it is done very well. The first track is a slow burner, ‘A Correspondence,’ uses a simple blues riff to introduce Buffkin’s incredibly distinctive voice and slow adds layers of instrumentation to build the song up, first with a little bit of piano, then harmonica and finally, reaches a climax of a full band number with drums and a lead guitar which works really well to introduce both the record and each of the individual contributors. ‘Does She Drink?’ takes the sound of country records from yesteryear and gives them a contemporary revamp, borrowing sounds and melodies from that era and making them his own and is a simple mid tempo ballad. Leading straight into a perfectly contrasting, yet still familiar, ‘Honey Bee’ which see’s Buffkin experiment with a more upbeat sound putting lead guitar at the forefront and allowing his band to shine through with both talent and flair, with sporadic musical interludes. During the midpoint of the record, the tracks hit a bit of a lull and Buffkin has opted for a more relaxed sound with the double-barrel of ‘Doin’ Life’ and ‘Houston St.’ However, the songs lose the momentum built with the previous track ‘Honey Bee’ which derails the flow of the record a little but soon gets back on track with another throwback drinking song ‘Today Was a Liquor Store’ and the record eases out with three lazy afternoon, southern songs ‘Play Another Sad Song,’ ‘Rollin’ Too Hard’ and ‘Tie One On’ which features some perfectly composed pedal steel on top of a tender, traditional ballad and a great way to finish off the record. 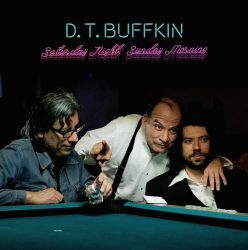 Overall, D.T Buffkin isn’t breaking any new ground on ‘Saturday Night, Sunday Morning’ but the record works well as both a throwback to the early sounds of the genre but also, as a contemporary contribution to the catalogue of classic sounding everyman songs. D.T Buffkin clearly has a knack for great melodies and great songmanship and as his career grows, it will be interesting to see how he utilises those skills to branch out further and take things in his own direction.